(CNN) -- American Levi Leipheimer edged closer to retaining his Tour of California title after finishing in the peloton at the end of the seventh stage, won by Italian Rinaldo Nocentini. Leipheimer is homing in on his third Tour of California title after finishing safely in the peloton on stage seven. Nocentini was among a 10-man breakaway, which included big names George Hincapie, Frank Schleck and Christian Van de Velde, which stayed clear for most of the day. With less than 4km to go, Nocentini, New Zealander Hayden Roulston and Dutchman Pieter Weening made a decisive move -- and it was the AG2R rider who proved strongest in the sprint, pipping Roulston by the narrowest of margins. 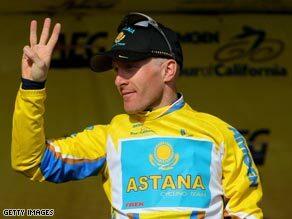 Leipheimer, along with Astana team-mate Lance Armstrong, finished two minutes down on the leaders to retain his 36-second overall lead from compatriot David Zabriskie. Meanwhile, seven-time Tour de France champion Armstrong lies a respectable sixth overall in only his second race since returning to action. The final stage, which finishes in Escondido near San Diego, features four climbs, including the highest ascent ever seen in the race at Palomar Mountain.